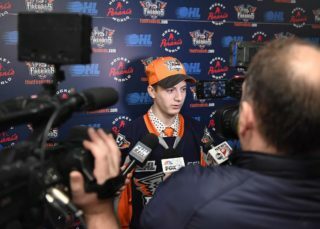 Flint, Mich. – The Flint Firebirds announced today that Luke Cavallin, the highest goaltender selected in the 2017 OHL Priority Selection, has committed to an Ontario Hockey League Standard Player Agreement and education package with the Firebirds. 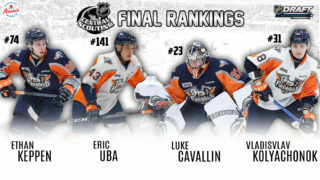 Cavallin was highly touted as the best goaltender in the 2017 OHL Draft, being selected by the Firebirds in the second-round, 28th overall. 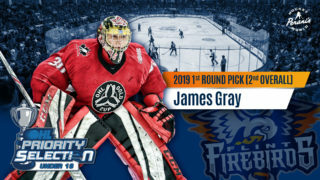 The six-foot, 170-pound netminder recorded an impressive 2.22 goals against average (GAA) including a .920 save percentage (SAV%) in 25 games played with the Kemptville 73’s AAA Hockey Club last season. In playoffs with the 73’s, he posted a 1.41 GAA and a .952 SAV%. Luke was also among seven of the top Under-17 netminders with ties to the OHL that were selected to attend Canada’s Program of Excellence goaltending camp June 9-11 at Olympic Park in Calgary, Alta. The Firebirds’ training camp will take place Monday, Aug. 28 through Wednesday, Aug. 30 at the Firebirds’ official practice facility, Iceland Arenas on Elms Road in Clayton Township. Season ticket packages for the Flint Firebirds 2017-18 season are on sale now and can be purchased at the Dort Federal Event Center Box Office, Monday thru Friday from 9 a.m. to 5 p.m. (ET). Season ticket holders receive FREE parking this season. For ticket information, contact Kevin Mays, Director of Ticket Sales at (810) 201-6903 or kevin@flintfirebirds.com.